Knack and Rime lead the PS Plus lineup going live next week. February is a short month, so be sure to plan accordingly with all of these great games coming to PS Plus this month! First up, we have RiME. This single player puzzle adventure is set in a beautiful world where you play as a young boy who has awakened on a mysterious island after a torrential storm. Armed with your wits and a will to overcome, you must explore this mysterious island, reach the tower’s peak, and unlock its closely guarded secrets. Next up is the family friendly adventure game Knack. Take control of Knack and his signature size-shifting abilities to protect the world from a dangerous threat – the invading Goblin Army. 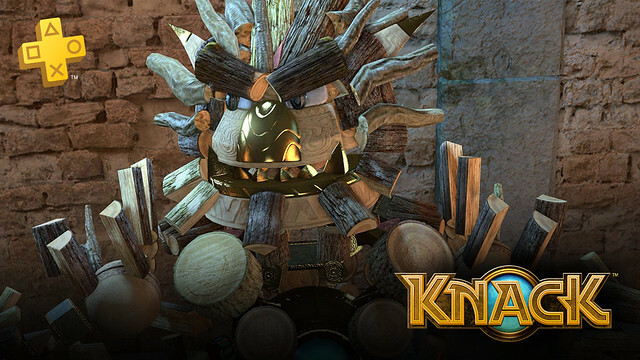 Knack is a fun-filled adventure that lets players wield fantastic powers and discover a uniquely vibrant world. Just as a reminder, all PlayStation Plus members can get Starblood Arena as a bonus game through March 6. This arena combat game was built from the ground up to be played in VR with your PS VR headset*. Attack, evade, and move in any direction as you compete against pilots from across the galaxy. You’ll fight for glory, credits, and your life. Lastly, for all Gems of War fans, get your hands on the new PlayStation Plus Starter Pack starting February 13th through March 13th. The pack includes the Nobend Brothers troop, capable of causing all kinds of trouble on the gem board without even losing a turn. It also comes with 10 rare gem keys and 2,500 souls to level up all your new troops. Get started on your journey today! And there you have it. See you next month! * PlayStation 4 system, PlayStation VR, and PlayStation Camera are required to experience VR functionality. Knack is a great game! KNACK BAIBEEE! A game so technologically advanced that it would anahilate the ps3 punny hardware limitations. IT’S A MAZTEPICE! Not sure why knack got so much flack. I love that game, played it more then any PS4 launch title by far and still revisit when I’m playing locally with friends. Thank you so much for a lovely PS3 month! I know Mugen Souls Z is a little old at this point, but I had never even heard of the series until it landed on Steam in more recent years, I’m eager to be able to give it a play~! Spelunker looks similar to Spelunky which I like a lot too so no complaints there. 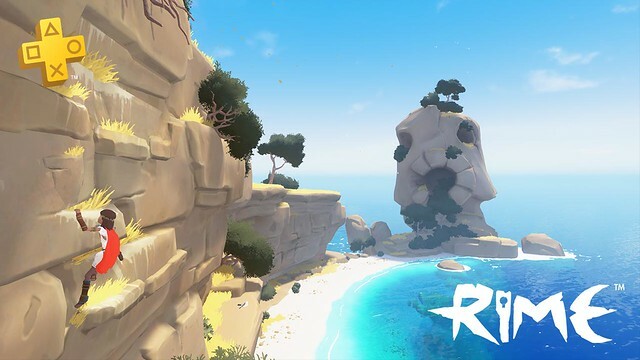 In the event I get a 4K PS4 somewhere waaaaaaay down the line when they are discounted heavily, having Rime might be nice too. For future months, please keep us Playstation 3 players in consideration! There’s a ton of things that while old, would still be great to have like the Atelier series, Folklore, Dynasty/Samurai Warriors….etc…. More titles from Koei/NIS America/Atlus would all be welcomed~! IMHO, Knack was not a great game but enjoyable for the co-op story campaign, but Knack II is one of the best co-op story campaign games that you can play and enjoy in recent memory. The difference in quality between the two is as wide as the difference between God of War (which I still feel is just okay) and God of War II which I still consider to be one of the best action-adventure games to date. I hope whomever gives the free Knack game a try and likes it okay enough, gives a second look to the far superior Knack II. Great lineup, i really enjoyed Knack and hopefully it will encourage ppl to get Knack 2 which is even better. It’s absolutely RIDICULOUS how whoever writes these posts can’t even be bothered to state the EXACT DATE new games go live. As if it wasn’t important at all. Or is this the company policy? While I am always a firm believer that the discounts on games is where the true value of the Playstation Plus free games (especially the winter and summer sales) comes from I always find it funny when those “leaked” lists comes out with great AAA titles on it and people fall for it every time when almost every month the free games are not good AAA titles but indie games or AAA titles that sold horribly. They are free so no reason to complain and there is an occasional good AAA title or indy game on the list. The games always go out of the first tuesday of the month, which is usually the tuesday after this is posted. I liked the Photoshop version of this months line-up much better…PlayStation could learn a thing or two from the guy who made it. I paid for a year long membership a while back and I’ve been mostly disappointing in the benefits I’m getting from purchasing it. I don’t care what people say, Knack is bad. I feel like the only reason a lot of people get hyped about it is because of Dunkey. I’ve been meaning to go back to Knack. They have this thing where you use a mobile phone to do puzzles, and then the puzzles give you rewards, that then goes back into the main game, and I ended up playing the heck out of the mobile game for weeks and then just never went back into playing the actual game. I’ll have fewer excuses now that I don’t have to find the disc. From what I understand most of the negative reviews revolve around the following things. 1. It’s very childish, story included. 2. It’s actually kinda punishing… so you don’t want to actually ummm… have children play it. 3. The campaign is a bit all over the place. But I guess since it’s a 3D Platformer Beat-em up game that punishes you but in a less rewarding way than a Souls game… It’s not for everyone. At least give it a try. @TVippy new PS+ games are always released after the deadline of the previous free games. For instance, on the current free games’ store page it says “This price is only available from 1/2/2018 10:00 am to 2/6/2018 10:00 am.” Soo, the next batch of free games will be available on 2/6/2018 after 10:00 am. Is there a way to save/add games to my library without downloading them. I’m trying to save my monthly bandwidth allocation while adding games to my collection. You guys really need to LINK to the game page for each free game like Xbox does with their free games of the month announcement. Finally, Knack. We now should get all of those “I told you so” posts. Meh. Grand Kingdom it is then…. What a disappointing way to start of 2018!!! Is that what your family said today? Knack is a great game, amazing visuals and game play, give it a try. Its a puzzle game… Would say between the last guardian and the witness… The difficulty of the last guardian and visuals of the witness not the other way around. Knack is actually really fun and Knack 2 is fantastic. Rime is an excellent game with great reviews. Grand Kingdom is an rpg with solid reviews. Exiles End is a fun Metroidvania. Knack and Rime are actually very good PS+ offerings. Knack is a AAA and Rime is a high level indie with great reviews. Nice! Rime is one I’ve been wanting to play, and Grand Kingdom will be a nice game to have digitally since it’s cross save. Exile’s End looks interesting at least. Finally Rime! A game I don’t actually already own! Grand Kingdom, the other game that had similar combat to Indivisible but didn’t look nearly as good. I’ll still give it a shot though. I’m starting to feel like Sony should just discontinue giving out games for the PS3 and Vita though because man, they are scraping the bottom of the barrel. Half the time its games I’ve never even heard of. Just these generic looking games. At least if they stopped giving outgames for those systems they could afford to give out better games on PS4 consistently. What are you talking about? Mugen Souls Z is a great game and pretty well known amongst the anime gaming community. I would be disappointed if they stopped giving free games for the Vita. I play my Vita more than any other system, including my PS4. It’s so much easier playing portable games, than it is being chained to a television screen. Besides, since when is Grand Kingdom the “bottom of the barrel”? That’s a AAA game. Awesome line-up… been waiting to play RIME for ages. Knack doesn’t get much love, but excited to try it. I’m actually surprised it took them 4 years to finally add Knack to PS Plus, but seriously, Knack is a good game I really enjoyed at the PS4 launch. It’s not amazing by any means, but people seriously give it too much hate than it really deserves. Well I brought Knack awhile back on Discount but never started it. Perhaps it’s a good time to start. I am slightly disappointed that we didn’t get Far Cry 4 maybe in the future some time. You can get it, just gotta be a new Subscriber. Worst decision ever, imo. Epsilon, where did you see this new subscribers get Far Cry 4 thing? Got a link? @Crunchewy : It IS true. Sounds like a joke…but it isn’t. BUT…and this is what happens when you do all these regional PS+ BS that Sony loves so much…it’s an EXCLUSIVE deal for EUROPE only. So no harm, no foul for the ones in America. They never intended for us to receive it anyway. Bleh. Came here to read the comments from “gamers” complaining about the selection of games for the month. The sense of entitlement grows stronger by the year. $ .62 a game and they have to whine. Sad. Rime! So worth it just for that alone. I agree knack is not very good. when I got my PS4 I got knack but I exchanged it for something else as it was not fun. this is one of the better lineups we have in a while for all systems. thank god there is not another visual novel game this month. Grand Kingdom is really the gem in this lineup. So disappointing, knack is trash we deserve better. Knack 1 or 2? I see two games in store. Knack 1 is a game from 2013. Go buy them, they’re very easily had for $20 nowadays. They’re old games mate. For a free ps+ i think it’s ok. I’ve played it before and it’s an okay platformer. where is Far Cry? Far Cry? FAR CRY? You have to be a new subscriber to get free Far Cry 4. No joke. Hahahahah. God help you if you’re comment wasn’t really meant as sarcasm. so funny, but I’m actually excited to play this with my kids. I played it with my kids last year, and they loved it. My boy (6) was sad when we beat it and the game was over. But then we got Knack 2 for Christmas, and it was game on! Co-op is awesome when you play with your kid. You can help them out through all the difficult parts, but they still help and contribute all the time. Perfect father/son bonding game. And my 4 y.o. girl loved watching every minute of it. Rime is very good, and it’s an easy platinum (as long as you’re willing to put in a bit of time). I hope they typo’d with Exiles End. There’s no reason that shouldn’t be cross-buy. Rime…heard good things. Easy Plat too. Looking forward to playing it. 3 Japanese games…hopefully this trend continues. Grand Kingdom is my number 1 title for Feb. Waiting for Resistance Burning Skies as a Vita offering. Already have these two ps4 games they are decent but not amazing. Knack is ok, but Rime is what makes February special! So is PS4 getting one game or what? Also I’m disappointed by the lack of good games people would actually enjoy. I only saw one good game on here and that’s it. We have to pay more money just to use online games like overwatch. A lot of us have to pay 60$ just for a 12 month membership and that was originally 50$ but changed halfway last year. I hope you guys actually give us some Game we can actually enjoy soon. 1. PS4 is getting free games this month or can you not read? 2. Good is a 100% subjective term when it comes to video games. I would rather play games like this before crap like Call of Duty personally. Knack is the only game I played and I liked it. It just didn’t have replay value other than trophies. The characters where blah and didn’t care about knack. I didn’t grow to care about any of the characters either. I say this is a good line up for those wanting to know if they should buy knack 2 or have been wondering about any of these titles. I’ll be dl’n knack for my children but that’s all that I think I’ll get. That’s why you shouldn’t believe uncomfirmed rumors on the internet. Those are usually started by trolls. I’m just going to urge everyone to be open-minded and actually try these games before judging them. They are free so it’s not like there’s any risk to you worst case scenario you don’t like it and you delete it. But at least then you can say you were mature enough to actually try it before judging it. Which is what really matters. Rime especially is deserving of a chance. It is a beautiful game that brought tears to my eyes. I agree with you here. I myself don’t have the funds for games so rely on PS+ to get extras. However I lost PS+ back in October or so and haven’t had the funds to activate it again. With the way things are going, I won’t get it again for awhile. Thanks for the games but why isn’t Exile’s End cross-compatible offering the PS4 version too? God D@MNIT!! I just bought Grand Kingdom! It was on sale this month. I promise you, I will never buy a “indie ish” game on sale EVER again because its just going to be free next month. Is this for PS+ us or Asia?